Born into a musical family, Ed started playing fiddle at the age of 4, learning Suzuki method. His musical interests cover a wide spectrum from Bluegrass to Celtic and beyond and he has been a regular instructor for Maine Fiddle Camp since 2003. 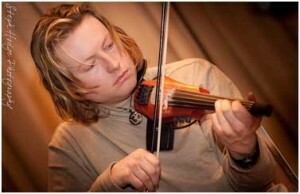 Howe has an extensive electronics background, and took an interest in the electric violin. He plays a 5-string NS Design electronic violin and is a featured artist on the NS design artist page. Ed makes extensive use of the BOSS RC-50 loop station to layer and orchestrate a variety of sounds from his instrument and watching him play bare footed and operating complex electronic equipment with his feet is a sight to behold. Check out a video of him playing solo by clicking here. Ed started the renowned contradance band, Perpetual eMotion with fellow staff member John Coté. Check out their website!